With the introduction of the video widget (#39994) and audio widget (#39995) it was discovered that the WMV and WMA file formats are no longer supported by MediaElement.js as of v3. While core is currently shipping with MediaElement.js v2.22, these file formats only play if the Silverlight plugin is installed, something which is less and less common since the plugin is no longer supported as of Chrome 45 and as of Firefox 52. So with the planned upgrade of MediaElement.js from 2.22 to 4.x (see #39686), it is a good time with the WP 4.8 major release to remove support for the formats. This has been done in  for #40819. Plugins would also need to implement fallback rendering routines via the wp_video_shortcode_override and wp_audio_shortcode_override filters, or else use a different library than MediaElement.js altogether via the wp_video_shortcode_library and wp_audio_shortcode_library filters. In the admin, the functional difference is that these formats are not listed as being available for selection in the Video and Audio widgets. Additionally, when you Add Media in the post editor, there is now no option to embed the player for these formats; only a link to the media will be provided, just as when attempting to add non-media files to content. What happens to existing content with this change? Can we do anything to mitigate potential issues? Screenshots of before/after the change would be a good idea since this could have an impact on existing content (including some that I believe I’ve used here on make/core before). My guess is that there’ll be issues once we actually update MediaElement.js, but this change may also have an impact. Either way, I would expect a reasonable “download file” fallback to happen on unsupported browsers – let’s make sure that happens. There may not be a lot of users using these formats, but those that do likely do so for all of their content, so this could be a big problem for those users (who may not have cared about limited browser support, etc.). There’s actually no difference before/after in terms of how the audio and video shortcodes render. There was already a Download File link provided, and this link remains after the removal of support. I updated the post to add a screenshot showing this. So…. you used to support WMA but you dropped it because it requires Silverlight? We are a church organization and we use a “recorder” to record messages (sermons). This recorder produces WMA files and I just cannot believe that it has Silverlight on it…. it is just a reorder? Converting files to MP3 quadruples their size so we would like to avoid doing this. 🙁 Any chance of support for WMA being brought back without requiring Silverlight? @tonyrobson The issue is that MediaElement.js—the underlying library that WordPress uses—no longer supports Silverlight. 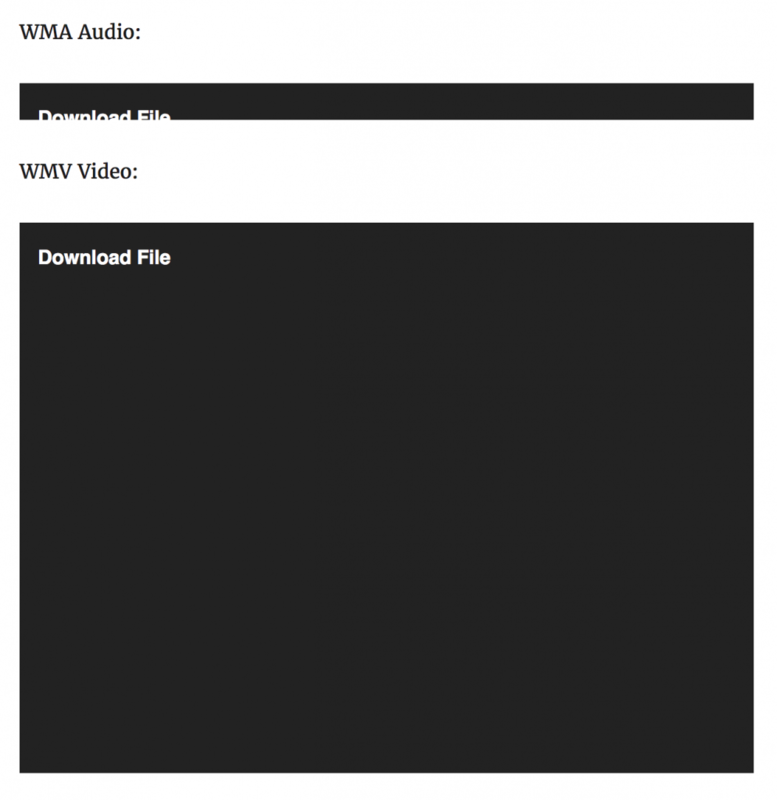 If you want to support WMA and WMV files, then you’ll need to use a plugin to add support for them. I am not aware of any plugins yet developed for this need, however. Do you know if they work? Tony, the issue is more that browsers don’t natively support playback of WMA files by default, so something like Silverlight is needed for them to play those files. Since this is less common, it makes less sense to continue to support it in that manner. Now, whatever recorder you are using produces WMA files, but as you know, you can convert to MP3 rather easily. The “quadruple” file size is likely a byproduct of the converter method you are using, since MP3 and WMA are generally the same in terms of size vs. quality. You could optimize your conversion method to solve that problem. You could also consider converting to an MPEG 4 format instead. MPEG 4 audio frequently uses the .m4a file extension, and MPEG 4 is significantly better than WMA in terms of quality and filesize. MPEG 4 audio is also natively supported by most browsers, as well as by mediaelement.js. You should probably look into that format. A common way of producing M4A files is to use the iTunes software from Apple. It has a very good encoder and the settings are simple enough to adjust it down to the filesize you need while maintaining the audio quality you’re looking for. Thank you very much Samuel.